Warning: A dangerous new virus, FIV, is rapidly spreading the globe. This part 1 of a very long post. The symptoms of the disease are complex. Part 1 addresses the symptoms of the disease and part 2 continues with more symptoms and a discussion about preventative measures and cures. Scientists have dubbed the disease, FIV, the Fiscal Insanity Virus. FIV is more contagious and far more dangerous than the common flu virus now making its rounds. The primary symptom of FIV is irrational, often delusional fear of deflation. The virus has an uncanny ability to seek victims in positions of authority. Those afflicted with the virus start taking (or promoting) fiscally reckless actions guaranteed to damage the host country. FIV's most recent victim is Bank of Israel Governor Stanley Fischer. Evidence of affliction is irrefutable: Fischer Says Bank of Israel Will Do Everything We Can To Prevent Deflation. The comments suggest that he isn’t done yet cutting interest rates after already lowering the benchmark lending rate four times in the past 10 weeks. The reductions, including two unscheduled ones, pushed the cost of borrowing to a record low of 2.5 percent. The central bank is also buying $100 million in foreign currency a day to help weaken the shekel and make exports cheaper. Those severely inflicted with FIV show a marked propensity to compete in the race to ZIRP. For more on ZIRP, please see Global ZIRP And The "Impossible Contraction". That post was written on November 2. On December 16, ZIRP Arrives: Fed Targets Interest Rates 0 to 1/4 Percent. Bernanke "won" the mad dash to ZIRP. Scientists in 33 countries studying the disease have uncovered similar patterns in the DNA of every victim. To date, every person afflicted with FIV has been found to have one of two distinct Marker Chromosomes now identified as the K-Marker (Keynesian-Marker), or the M-Marker (Monetarist-Marker). No one with the recently discovered A-Marker (Austrian-Marker) has yet to contract FIV. Scientists conclude that those with the A-Marker may be biologically immune to FIV. Random DNA samplings of university professors are not encouraging. Scientists have discovered that 99% of all economic professors have either the K-Marker or the M-Marker. Economic professors, while not in a position to direct policy, are highly contagious. Those with FIV have encouraged those in positions of power to do reckless things. The victim is always in denial about the disease. A hair sample taken from economist Paul Krugman, professor of Economics and International Affairs at Princeton University, and Op-Ed writer for the New York Times shows an unusual pattern of multiple repetitive K-Markers. A hair sample taken from Nouriel Roubini, Professor of Economics at the Stern School of Business at NYU and Chairman of RGE Monitor shows the typical K-Marker pattern. A hair sample taken from economist Greg Mankiw, professor of economics at Harvard University shows unmistakable signs of the M-Marker. Interestingly, some scientists have reported Mankiw's hair sample also shows a faint trace of the A-Marker. Those scientists believe traces of the A-Marker are responsible for the train of thought found in Passing the Buck. More public projects would pass a cost-benefit test if we repealed the Davis-Bacon Act. This law requires contractors on these public projects to pay "prevailing wages," which are typically union wages well in excess of what would occur in a free market. If the government paid market-determined wages for infrastructure projects, we could have both more infrastructure and less government debt. Without doubt, that legacy would benefit future generations. Bear in mind the A-Marker trace in Mankiw is highly questionable, while the M-Marker is irrefutable. Inquiring minds wishing to investigate Davis Bacon more thoroughly should read Thoughts on the Davis Bacon Act and why it's a "real porker". Hair samples taken from Ron Paul, member of the US House of Representatives, have now been analyzed. Scientists report that Ron Paul has the only known double repetitive occurrence of the A-Marker. Scientists speculate that such individuals would be highly immune to FIV, even in the most highly diseased environments such as US Congress. Hair samples from Ben Bernake, Chairman of the Board of Governors of the Federal Reserve, were much more difficult to obtain for obvious reasons. However, the efforts paid off. In 10,102 samples studied by scientists globally, Bernanke's DNA sports the only known instance of multiple, repetitive, alternating K-Marker M-Marker pairs. Scientists now speculate those alternating markers are what inspired his infamous, if not delusional, helicopter drop speech in 2002, Deflation: Making Sure "It" Doesn't Happen Here. Clearly Bernanke has been afflicted with FIV for quite some time. My rebuttal to Bernanke's speech was made on December 31, 2007: Things That "Can't" Happen. Ironically, it is the unvarnished arrogance by Bernanke in conjunction with greater fools who believe in his untested academic wizardry, that fostered the very extreme risk taking attitudes towards credit that makes deflation inevitable. Things that can't happen, are about to. The K's and the M's are now in open debate as to how best to improve destroy the economy. The K's, championed by professor Krugman want to squander dollars on massive government spending, believing it is possible to spend one's way to fiscal prosperity. The M's, championed by Mankiw think that cheapening the dollar via massive printing, in and of itself is sufficient to heal the economy. Even if the Fed cannot reduce nominal interest rates, it can reduce real interest rates by committing to a modest amount of inflation. I am more comfortable having the Fed commit itself to modest inflation than having the federal government commit itself to a trillion dollars of new spending. The more we can rely on monetary rather than fiscal policy to return the economy to full employment and sustainable growth, the better off future generations of taxpayers will be. Of all the things that Roosevelt did to get the economy out of the Depression, jettisoning the gold standard was the most successful. Today, monetary policy is fettered not by gold but by fear of inflation. Perhaps it is time is get over that fear, at least for a while. Actually, Greg has arrived at the same conclusion I did more than a decade ago, when I tried to model the problems then facing Japan, and now facing us. As I pointed out back then, the essence of a liquidity trap is that the real interest rate is too high, even when the nominal rate is zero. So the theoretically “correct” answer, if you can swing it, is to create expected inflation, pushing the real rate down. As the K's and the M's battle it out, neither Krugman nor Mankiw has the faintest clue that both of them are wrong. Constant bickering between the two of them is a possible sign of extreme viral contagion. Both Krugman and Mankiw would be advised to read and understand a few books on my reading list. However, both are too busy, each stuck with their own academic theories, even though they have been disproved multiple times in real world applications. Mankiw's claim that "Of all the things that Roosevelt did to get the economy out of the Depression, jettisoning the gold standard was the most successful" is simply preposterous. Roosevelt confiscated gold by executive order in 1933. 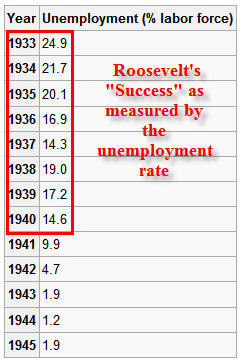 The chart at the left shows the "success" of Roosevelt's policy as measured by the official unemployment rate. In the 8 years shown from 1933-1940, the lowest unemployment rate was 14.3% in 1937, hardly a glowing testimonial to the "success" of Roosevelt's policies. Employment only increased as a result of the war effort and thereafter by the massive destruction of productive capacity worldwide during the war. Note that destruction of productive capacity is not a good thing, although it may have seemed like it from the point of view of the US whose productive capacity was not destroyed. Mankiw's statement proves without a doubt, that he, like Bernanke and Krugman, does not understand either the cause or the cure of the Great Depression. Another symptom of the disease is those afflicted struggle with the definitions of inflation and deflation. A poll of those with the A-Marker show a clear understanding of the definitions as well as the cause of each. In both cases credit needs to be marked to market. Using a proper definition deflation of deflation, we are clearly in it. Those confused about the definition or anyone needing to see a rock solid evidence that we are in deflation need to read Humpty Dumpty On Inflation. In CPI Drops Most On Record, What's Ahead? I presented a deflation timeline. The US has been in deflation since March of 2008, if not before. March 17, 2008 Now Presenting: Deflation! April 22, 2008 Deflation In A Fiat Regime? everyone to play swap-o-rama with the Fed supposedly just to prove the process works tells the real story. The real story is deflation. We are in deflation now, but few see it because they do not understand what deflation is: a net contraction of money supply and credit. The only question now is how long deflation lasts, not whether it gets here. So far, none of the liquidity measures taken by the Central Bankers have worked. The reason is simple: You Cannot Patch a Busted Dam With Water no matter how hard you try. The data are crystal clear. We are not in a period of inflation, we are not in a period of stagflation, we are not in a period of disinflation. If you exclude all the options proven to be impossible, the remaining option no matter how unlikely it may seem at first glance, must be the correct answer. That answer is deflation. We are in it, and have been for some time. Those who focused on Peak Credit and its counterpart Peak Earnings saw this coming. Those blindly looking at prices or money supply alone are still trying to figure out how and why treasury yields are where they are, the stock market has collapsed, commodities have plunged, and banks are scared to death to lend. The cause of deflation is the unsound credit boom that preceded it. The cause of the unsound boom is fractional reserve lending and micro-mismanagement of interest rates by the Fed. It is axiomatic in nature that the cure cannot be the same as the disease. It was reckless spending that got us into this mess, so reckless spending cannot possibly get us out of this mess. Yet, those afflicted with FIV keep attempting to do just that.